Each week, The Rebel Walk’s Jeff Tetrick takes a look at the Ole Miss Postgame Points, examining five takeaways from the Rebels’ most recent football game. Here are his Postgame Points from the game against Texas A&M. Ole Miss dropped its road contest to Texas A&M by a final count of 38-24 on Saturday at Kyle Field. 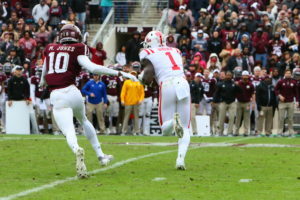 The Rebels entered the fourth quarter in a 21-21 tie with the Aggies, but Texas A&M pulled away in the final fifteen minutes to secure the victory. Ole Miss stands at 5-5, 1-5 SEC with two games to play in the 2018 season. Ole Miss sets out for its last road trip of the year against Vanderbilt this weekend. The Rebels have some history on their side entering this annual matchup with the Commodores. Ole Miss defeated Vanderbilt 57-35 in last season’s meeting in Oxford. The Commodores beat the Rebels in the last matchup in Nashville in 2016. Ole Miss won three straight meetings with Vanderbilt between 2013-2015, with two of those victories coming in Nashville. Not only has Ole Miss won four of the last five games against Vanderbilt, but the Rebels lead the all-time series with the Commodores by a margin of 51-39-2. Wide receiver A. J. Brown made history with his performance against Texas A&M on Saturday. The junior from Starkville caught 6 passes for 127 yards in the game to continue his stellar season. Brown has hauled in 72 receptions for 1,047 yards and 5 touchdowns this autumn. He has five 100-yard games this year after Saturday’s performance in College Station. Brown etched his name in the history books three times against the Aggies. First, Brown became the all-time leader in receiving yards at Ole Miss. Brown has 2,711 yards receiving in three seasons wearing the red and blue, passing Shay Hodge for the top mark in school history. Second, Brown became the first Ole Miss receiver to record 1,000 receiving yards in consecutive seasons, after he set the school record with 1,252 yards last fall. Laquon Treadwell ( 1,153 in 2015) and Shay Hodge ( 1,135 in 2009) are the only receivers besides Brown to have recorded 1,000-yard seasons at Ole Miss. Third, Brown tied the school record for career 100-yard games with his eleventh such effort, tying the mark held by Chris Collins (2000-2003). Brown moved up to third on the all-time receptions list at Ole Miss, as well. Brown has 176 career catches in 3 seasons. While he is not likely to catch Treadwell (202) or Collins (198) for the top two spots on that list, A. J. does have a chance to set the single-season receptions record. Brown has caught 72 passes this year. With two games left, A. J. could move past Collins (77) and Treadwell (82) to set that record. While Ole Miss struggled to run the ball after Scottie Phillips was injured early in the game, the Rebels put up some big passing numbers against Texas A&M. DaMarkus Lodge and Octavious Cooley stood out for Ole Miss, in addition to the record-setting day by A. J. Brown. Lodge grabbed 6 passes for 122 yards and a touchdown, while Cooley caught 3 balls for 66 yards. Senior quarterback Jordan Ta’amu had another tremendous effort leading the aerial attack by completing 22 of 35 passes for 373 yards and 1 touchdown with no interceptions. 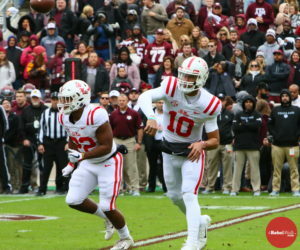 After creating just 1 takeaway in the previous 3 games, the Ole Miss defense registered both an interception and a fumble recovery against Texas A&M. 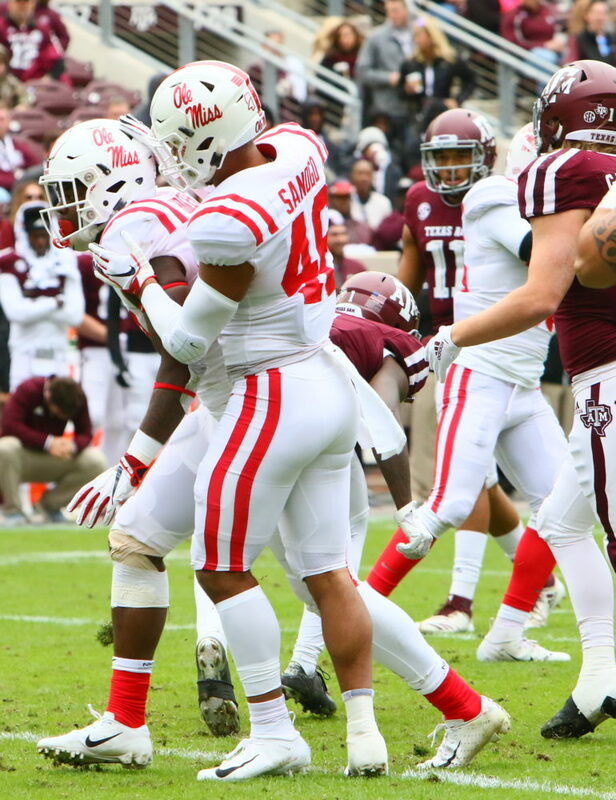 It marked the first multiple-turnover game for the defense since the win over Louisiana-Monroe, which was the last of 5 straight games in which the Rebels had 2 or more takeaways. The defense not only created 2 turnovers on Saturday, but it took the fumble recovery back for a touchdown. Zedrick Woods picked up the fumble forced by Willie Hibbler and rumbled 96 yards for a touchdown. This marks the third defensive touchdown of the season for Ole Miss. Also, Ken Webster intercepted a Kellen Mond pass for his first pick of the season. 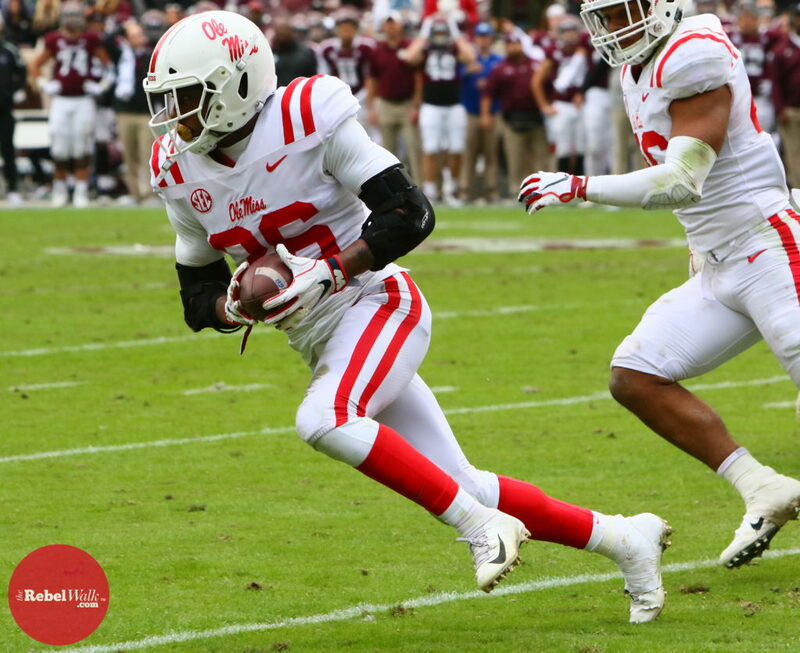 In addition to the takeaways by Webster and Woods, three other Rebels were standout defensive playmakers against the Aggies. Each of these guys played at a high level on Saturday, but the real silver lining is that each will return next season to anchor the defense as leaders. Mohamed Sanogo paced the Rebel defense once again as its leading tackler. The sophomore from Texas recorded 16 tackles and a tackle for loss against Texas A&M. Sanogo matched his career-high in tackles, as he had 16 stops against Auburn last month. Sanogo has finished a game with double-digit tackles on 5 occasions this season. He leads Ole Miss with 92 tackles on the year. Junior Josiah Coatney had a career-best 9 tackles and played with a lot of energy on Saturday in College Station. Redshirt-junior Willie Hibbler set a career-high with 7 tackles against the Aggies. Hibbler recorded 2 tackles for loss and forced the fumble that Zedrick Woods scooped up and returned for a touchdown.